subject are always preserved, the type of picture only depends from the chosen perspective. Then there is the vertical view from above where usually the third dimension is lost. But that is not important for this perspective. In fact this arrangement is for capturing subjects photographically, that are two-dimensional anyway or where surface, structure, pattern or array etc. is the point. This extends to the aerial photograph, that – taken from an absolute vertical position – will serve as a basis for the production of maps. If you want to do reproductions with an ordinary camera, the use of a -> stand or a copying device is indispensible.” (Urs Tillmanns, Photo Encyclopedia, Schaffhausen 1991). And here we are, dealing with the subject. As ”faithful rendition” is not always necessary any more, we should perhaps not speak of reproductions, but of a special way of ”image capturing”, because this has no meaning with respect to the rendition of the “captured” subject. And this fits today’s digital photographic world much better. Much of the “capturing work” is done by the flatbed scanner, often limited to letter format sizes, but cameras will also find many fields of application here. 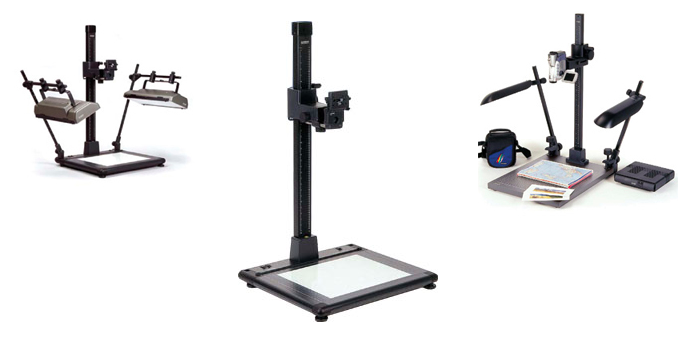 The indispensable copy stand for that purpose, the often equally essential lighting equipment and many more useful helpers can be found on the following Kaiser copy stand pages. Only when the copy stage and storage stage (film, chip or scan area) are absolutely parallel, and all angles are exactly the same as the original will the captured image be in accordance with the original’s geometry. Meyer Instruments, Inc. has the knowledge and expertise to put all the pieces together, aligned to perfection, for the best results. Kaiser Copy Stands for image capturing applications are both stable and precise. They usually have a baseboard to carry the original (sometimes with an integrated lighting system for transparent originals), a column and a camera arm. Various lighting units are available for reflective originals. The height of the camera arm can be continuously adjusted on the column. In this way the desired frame and reproduction ratio can be set with high precision and consistent parallelism. Depending on the size and weight of the camera, the size and nature of the original and other requirements there are camera stands in different sizes and lighting units in various configurations. Please read the next pages to get acquainted with the respective product families.